I have been a West Michigan native my entire life Born and Raised in Petoskey, a couple of years in Traverse City, I ended up settling in West Michigan Proper in 1999. A Graduate of Grand Valley State University with fancy degrees in Broadcasting and Marketing. I got my first job in radio when I was 15 running local high school football games and more or less have been involved in radio ever since. I spent several years in the Grand Rapids radio scene in many formats of music but was always a fan of what was called “oldies” back then. In fact, I even created the Classic Hit or Miss www.classichitormiss.com which features long lost classic tunes from the 60’s, 70’s, and 80’s that radio and others have forgotten. I currently also wear many other hats, including working a Berlin Raceway as an announcer and many other things, and also am an avid pinball machine collector and have a small side business GR Pinball, in which I buy, sell and service pinball machines. In my free time, I’m a musician (Pianist and singer), love racing, local sports, exploring, and enjoy Michigan’s natural beautiful environment. To my mind, there is no place more fantastic than the Pere Marquette beach! 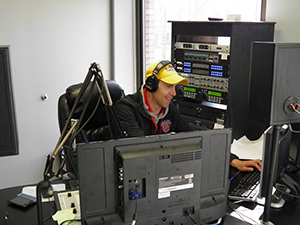 I’m thrilled to be part of a local home-town radio station and to be part of the community. I have lived along the lake shore, for 27 years and consider the Muskegon area my home. 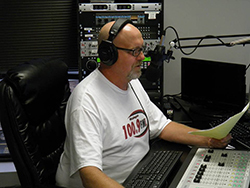 I have spent 20 of those years on the radio in the west Michigan area. I am looking forward to once again serving the community that I love. Some of my outside interests include Cooking, Michigan State sports, Golf, Church, hanging out with my kids and my dog Tank.